Whatever your bathroom design might be, adding a half wall is a nice design element. Remodeling an existing bath into a half wall bathroom provides a different level of versatility and complements almost any design. There are many reasons to use a half wall in your bathroom. Spread more light throughout the room. Most bathrooms, especially in older homes, have only one window. If you can reduce the number of floor-to-ceiling walls in a bathroom without taking out a load-bearing wall, you'll have more natural light. Make room for a decorative feature. 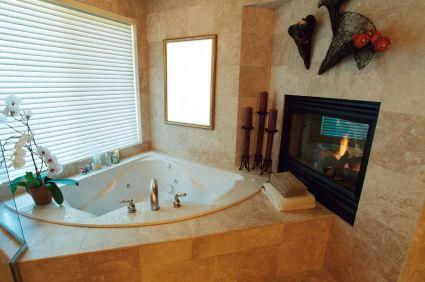 Many homeowners are converting utility bathrooms into more of a spa paradise, complete with hot tubs and fireplaces. In master suites, fireplaces are often built into half walls that separate the bedroom from the bath. Add more functional space. If two people feel comfortable sharing a bathroom at the same time, it helps to divide the space to accommodate individual tasks. Ensure privacy. Partitions are most often used to provide privacy in the toilet area. The types of materials to use for half walls vary widely. Some homeowners extend the decorative look of the floor or shower tile onto the half wall. If you don't want to invest more money into tiling the wall, but do have some fragments of tile left over, paint the wall and use the tile pieces as an accent. 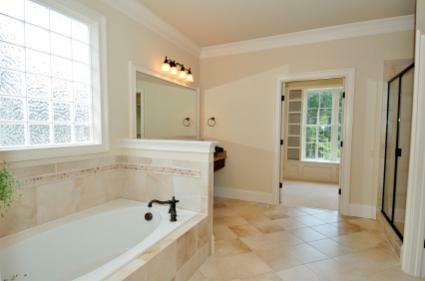 Half walls can follow the line of the new or existing bathroom cabinets, and other architectural features of the room. Glass block is a popular partition option as well. Some systems use aluminum framing and acrylic blocks, while others are glass set into grout. This method really lets the light shine throughout the room. Get creative with other materials, too. A long piece of stained glass suspended from the ceiling makes a good half wall, as would a series of old window panes still set in their framing. Both of these items can be found at salvage and antique stores. Also consider building a shelving unit that matches the woodwork or the bathroom hardware. The gallery of half wall bathrooms at Digs Digs demonstrates how these walls can be designed for more than just separating the toilet from the vanity. They offer wonderful examples of how to use half walls to maximize space while at the same time creating separate function areas so the bathroom can be used by more than one person at a time. Each book contains hundreds of photos and suggestions for different spaces to help you make better design decisions. For the cost of a book or some decorating magazines, you can also gain inspiration from a site like Get Decorating.com. The site offers thousands of home improvement ideas and pictures for bathrooms, as well as other remodeling and building projects. When you're finished with your project, post before and after images. The site also helps you connect to various types of contractors in your area. A three-month membership costs $24.99; a one-month membership is $16.99.